Goldsmiths UCU executive resolved to support the current in-housing campaign Goldsmiths security staff last week. You can read the full text of the motion below. Add your name to their petition here. Please pass on to colleagues who may interested. Join the Valentines Day protest on Thurs, 14th February, 12-2.30, Deptford Town Hall. Attend the Take Back Our Campuses joint Goldsmiths UCU – Student Union meeting on Thurs 14 Feb, 4pm, SU Café where security staff will talk more about their campaign. Motion in support of security in-housing campaign, passed by GUCU exec, Weds 6 Feb.
On Saturday 13 January, Goldsmiths security guards union branch (The Independent Workers’ Union of Great Britain Security & Receptionist Branch) voted unanimously to campaign to be brought in-house at Goldsmiths. The workers are seeking the same terms and conditions as their in-house colleagues, which include a workplace pension and equal entitlement to holiday, sick, maternity and paternity pay, as well as other staff benefits. Support shown by UCU and its members to the cleaners’ campaign played a crucial role in the eventual decision to bring cleaners’ in-house. 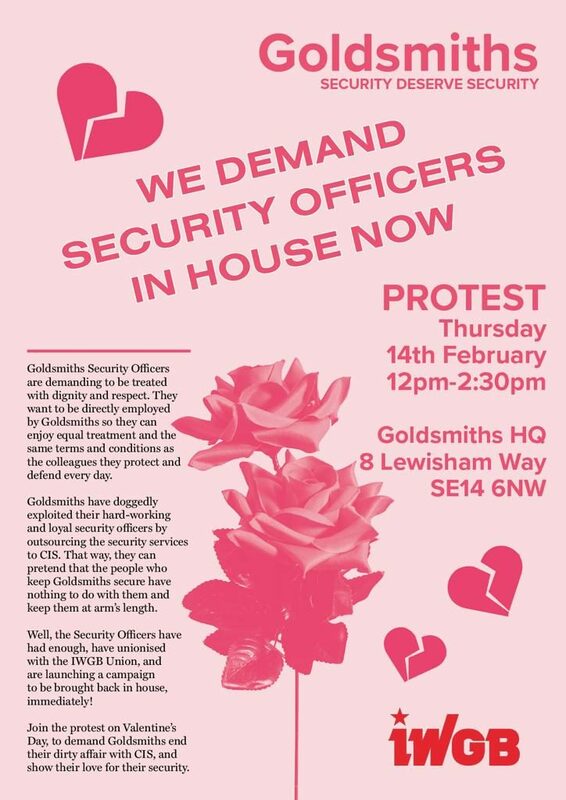 Security and their union representatives IWGB have requested the support of all staff and students for their campaign and have specifically requested the formal support of Goldsmiths Student Union and GUCU. The Student Union have already passed a motion to officially support the security in-housing campaign. This motion formally acknowledges UCU’s support for our colleagues in security in their campaign to be brought in-house. Having exceeded the threshold for membership density among security staff, IWGB are now the legal union representatives of security workers at Goldsmiths. IWGB have requested formal union recognition by CIS and requested that Goldsmiths management enter into formal negotiations about their members’ demands to be brought in-house. Both have refused. As IWGB have now become the legal representatives of our colleagues in security, this motion would commit UCU to take the necessary steps to request the introduction of IWGB to the Joint Negotiation and Consultation Committee (JNCC).